Today’s consumers break from the traditional flooring systems of the past! Consumer’s today are not looking at hardwood floors and carpet as the only choices for floor finishing. In fact, they are looking for more unique alternatives that provide low maintenance, reasonable installation cost, longevity, substantial appearance and most important personal uniqueness for their particular project! All but gone are the days of cleaning carpets and restoring wood floors or worse replacement due to flood damage. Consumer’s today want floors that are easy to care for and provides years of beauty and service without the usual maintenance. They are also looking for floors that are as unique as they are. Stained floors, say in you basement, are all the rage. Each floor comes out differently as the stain reacts differently with every floor. This is because the stain reacts directly with the character of that concrete, how it was finished, the flaws, the natural discoloration within the concrete and other proprietary characteristics to produce a finish that is specifically unique to that concrete surface. Couple this with the vast color selection and you now have a conversation piece. This is not your typical looking floor. These floors are gorgeous and extremely low maintenance. And they feel so substantial under your feet. If you are looking for best flooring system we recommend a grind, stain and seal floor that will be the envy of all your friends. But you are welcome to tell them about us okay? We get pretty creative around here and the sky is truly the limit! Imagine the possibilities and give us a call for a free consultation. Concrete Restoration Systems and its parent company have been serving the Denver Area since 1978 and we have an A+ rating with the BBB. 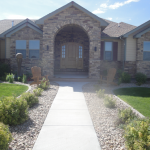 We provide free consultation in your home by calling us at 303-435-3334. Let one of our experts help obtain the most beautiful floors for your unique project. Acid stained flooring treatments are becoming an increasingly popular staple in Colorado with all many long-term benefits for homeowners. These beautiful floors have quickly caught attention with consumers due to their low maintenance and striking appearance. With the changing seasons and temperatures in the Rocky Mountain Region homeowners are more susceptible to additional water damage, flooding, cracking and other costly issues. Where traditional carpeting used to be the norm for homeowners, they are recognizing the cost and hassle of replacing carpet instead of exposing and exaggerating the beauty of their floors is not only more practical but more advantageous. The process of turning a typical basement floor plan into a personalized and conversational piece for homeowners is very appealing. 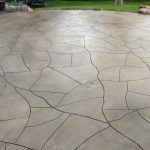 Similar to the popular trend of resurfacing driveways in the Spring, homeowners and those fixing and flipping are taking advantage of amplifying what assets their home currently has and turning them into a work of art. 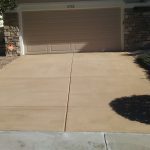 Besides increasing the curbside appeal and value of their homes by acid staining and protecting their basements, or driveways, the cost savings of concrete that is acid stained is significant. The process itself is as unique as each project. Since the acid reacts directly with the available minerals and rusts in the surface of the concrete the finishing flaws and imperfections create an unimaginable result that is striking. Personalization is ensured as the stain reacts with each surface differently. While many have tried DIY projects like this is can be very dangerous and is best to leave it up to a professional that can get exactly what you want and make it last. Concrete Restoration Systems has worked with client’s homes, both interior and exterior for decades in the Colorado area. 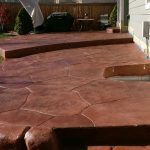 Basements, exterior patios, driveways and even commercial floors all can professional stained to accentuate the natural beauty of a home or office with a new look. The company has developed its own products to ensure the quality and performance of the treatments, such as the Duracrete 2000 micro-topping system with metal reinforcing. 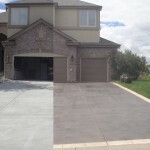 The architectural design backgrounds of the professionals at Concrete Restoration Systems are changing the face and surfaces of Colorado’s homes and leading a new makeover for homeowners inside and out. 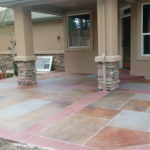 Concrete Restoration Systems is Denver’s premier decorative contractor, providing Colorado homeowners with the ultimate in custom designs and installation for all of their decorative concrete needs. Proudly serving Colorado and the greater Denver Metro Region for nearly 40 years under the same ownership, CRS provides its clientele with the ultimate in quality resort style living in their own property. 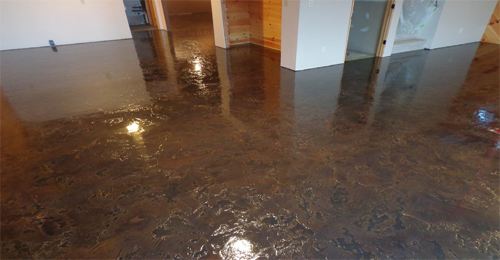 With a full-time architectural, CRS ensures its clients get the most out of their decorative concrete investment from resurfacing to personalized acid stained floors. Stained basement floors are all the rage in recent years to Coloradans. For nearly a decade, traditional carpeting was the typical choice for flooring in a basement. However, with the flooding and introduction of stained basement floors and advancements in technology, it has really caught on to consumer’s attention due to their low maintenance and substantial, bold appearance. 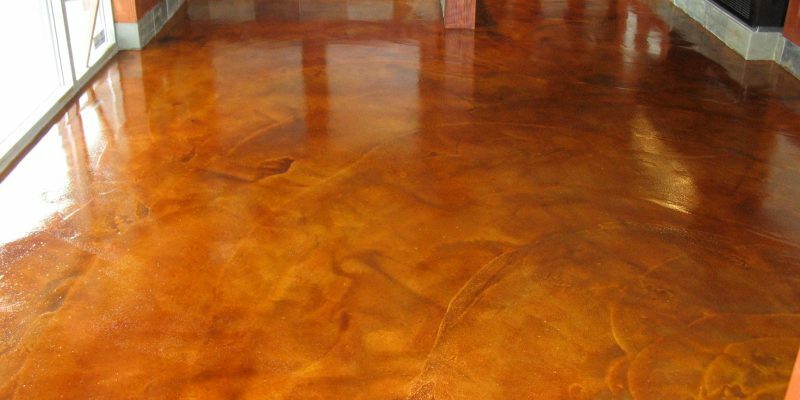 Turning a typical basement floor plan into a conversational piece, these high-end stained floors are easily maintainable and require very little clean up, and even repair work, as they are impervious to water or water damage. Additionally, they create an industrial look to the room and inspire creativity. They clean up with a mop and never need replacing or steam cleaning! Each floor has its own uniqueness and appearance as the stain reacts differently to each concrete surface. In acid stained floors, the acid reacts directly with the available lime in the surface of the concrete and even the finishing flaws and imperfections to create an unimaginable result that is extremely unique and beautiful! The acid stains are available in an array of colors to provide the perfect addition and finish to your home or business. Depending on your choice of color for a stained floor, there is a wide array of colors that are not only very vivid and audacious but also create a home-like vibe in the room making it welcoming to anyone. Because of the influence the floor stain has on any room, it is sure to glow iridescently to just about any shade of light. What is great about the design of stained floors and the lighting of the room is that it can give the floor a rippled look effect, almost like an illusion creating curiosity and imagination. 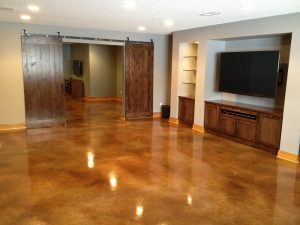 Here at Concrete Restorations, we highly recommend installing a stained basement floor for value, ease of maintenance and care and resale in the future. You will be very surprised at how substantial these floors look and feel. 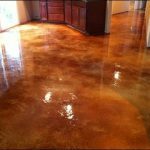 Stained basement floors are all the rage these days just as granite countertops became the gold standard just a few years ago. Folks are viewing carpet as a negative and a liability when considering the purchase of a home and the maintenance involved. Carpet can be a burden to some home flooring due to possible mold growth from liquid spills. 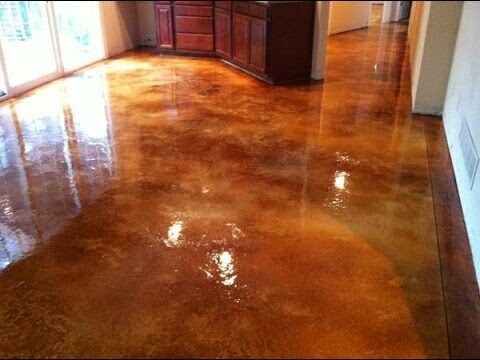 The beauty of concrete stained floors is that spills and dirt can be cleaned up in the sweep of a broom and best of all, the stain is unbreakable to wear away from any spill. 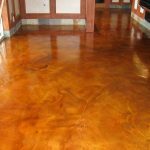 There are so many finishes to consider with the recent advancements in stained basement flooring that are now available to you, the sophisticated and product conscious consumer. Check back with us from time to time as we shall discuss the various new colors created and most advanced flooring and concrete restoration systems available in the market today! In upcoming publications, we will be discussing alternative stained basement flooring systems now available in granite, marble and leather-look finishes that will really jazz thing up! This will give your floor a look that is sure enough to bring stunning beauty to the eye of the beholder. You are welcome to call us for more information or a personal consultation to discuss specifically the variety of floors and finishes available to you of your own choosing! We can also help you with the design and architectural finishing of your basement or man cave with our in-house architectural designer that has over thirty years’ experience in this industry. For more information as to how we can get you a free estimate please contact us here. Stained basement floors are all the rage in recent years to Coloradans! For years, traditional carpeting was the typical choice for flooring in a basement. 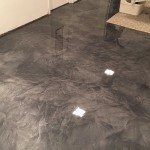 However, with the flooding and introduction of stained basement floors has really caught on with consumers due to their low maintenance and substantial appearance. Turning a typical basement floor into a conversational piece. These high-end stained floors are easily maintainable and require very little up keep as they are impervious to water or water damage. They clean up with a mop and never need replacing or steam cleaning! Each floor has its own uniqueness, as the stain reacts differently to each concrete surface. In acid stained floors, the acid reacts directly with the available lime in the surface of the concrete and even the finishing flaws and imperfections to create a random result that is extremely unique and beautiful! The acid stains are available in an array of colors to provide the perfect addition and finish to your home or business. 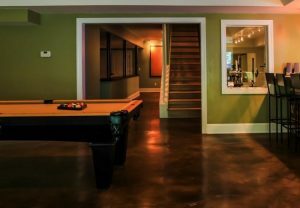 Here at Concrete Restorations, we highly recommend installing a stained basement floor for value, ease of maintenance and resale in the future. You will be surprised at how substantial these floors look and feel. Stained basement floors are all the rage these days just as granite countertops became the gold standard just a few years ago. Folks are viewing carpet as a negative and a liability when considering the purchase of a home and the maintenance involved. 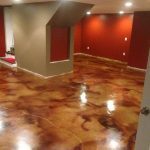 There are so many finishes to consider with the recent advancements in stained basement flooring that are now available to you, the sophisticated and product conscious consumer. Check back with us from time to time as we shall discuss the various and most advanced flooring and concrete restoration systems available in the market today! In upcoming publications, we will be discussing alternative stained basement flooring systems now available in granite, marble and leather-look finishes that will really jazz thing up! You are welcome to call us for more information or a personal consultation to discuss specifically the variety of floors and finishes available to you! 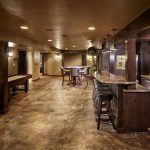 We can also help you with the design and architectural finishing of your basement or man cave with our in-house architectural designer that has over thirty years of experience in this industry. Hope this news release was helpful to you and again, please check back in with us from time to time for more home improvement ideas and solutions. Contact Us Here to Inquire about a Stained Basement Floor or More! 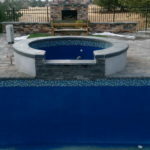 Concrete Restoration Systems, by Malibu Pools is leading a growing trend in the ever competitive Denver Home Market. 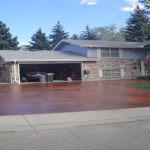 Homeowners are now refinishing their driveways with decorate concrete rather than replacing them, in order to increase curb appeal, and differentiate their home in the hyper-competitive and dynamic Colorado Real Estate Market. 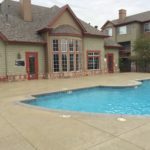 Coming from the custom pool and decorative patio industry, Dan Yalacki of Concrete Restoration Systems recognized the demand for homeowners to highlight and make their properties stand out among the crowd, and increase both the aesthetics or their home, as well as the property value. 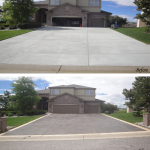 With the ever-changing Colorado weather, these homeowners have also discovered that refinishing their driveways, rather than replacing them, is less expensive, easier, faster, and also makes the home more valuable in the process. 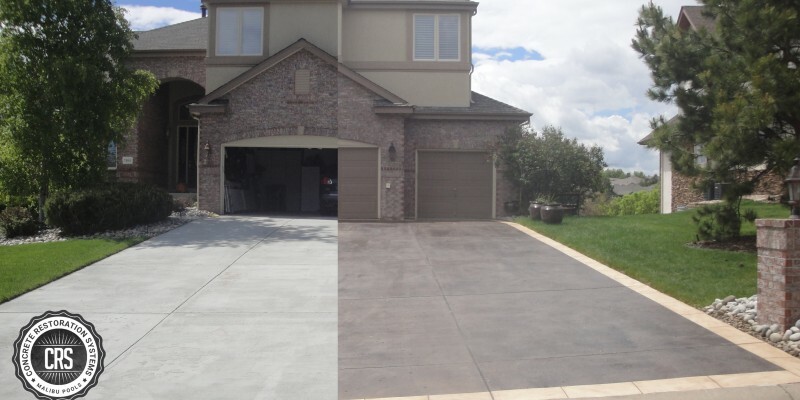 Our Exclusive driveway restoration Systems and applications such as CRS’s own Duracrete 2000, provide a beautiful, long-lasting improvement to your home. 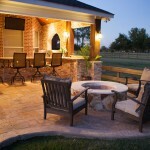 These are high end, high-quality systems and offer a great alternative to installing plain gray concrete. These custom decorative driveways are the newest home improvement for those considering replacing an older driveway. 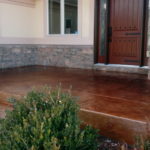 Homeowners can choose from installing a decorative grind, acid stain and seal system provided exclusively by our company in an array of beautiful colors and finishes. 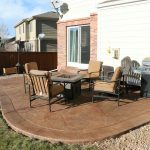 Or install a durable metal reinforced micro-topping developed and offered exclusively by our company in as many colors, patterns and finishes as you can ever imagine. Making every project unique! 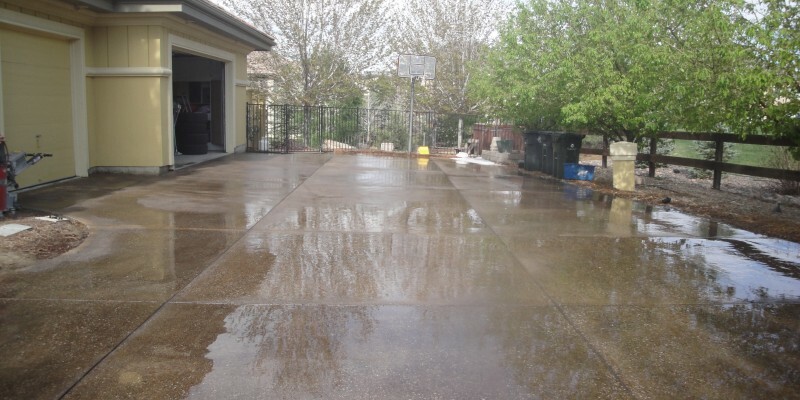 So don’t put up with a spalling and deteriorated concrete driveway, when you can have a gorgeous Concrete Restoration driveway from Malibu Pools. There is no limit to what you can do! 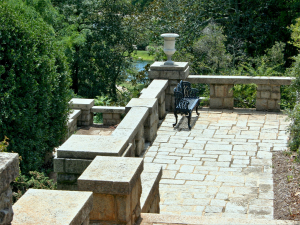 You can add decorative stone finished borders to the sides of your driveway, patterned stone finished accent walkways and entryways for that ideal, eye-catching look that you have been searching for and can enjoy your new driveway for years to come and should you decide to sell, the market appeal of these gorgeous driveways will ensure the greatest return of any improvement you can make to your home! 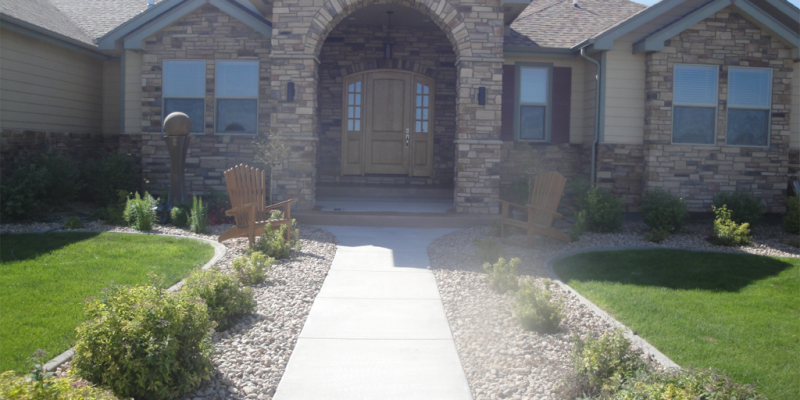 Dan Yalacki, the owner of CRS, is one of Denver’s oldest decorative concrete contractor. 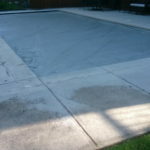 Providing decorative concrete solutions for custom pools, patios, and driveways since 1978! 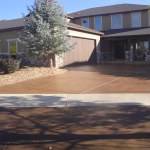 Providing real solutions for homeowners decorative concrete needs. 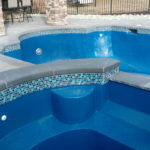 Concrete Restoration Systems by Malibu Pools is Denver’s premier decorative contractor, providing Colorado homeowners with the ultimate in custom designs and installation for all of their decorative concrete needs. Proudly serving Colorado and the greater Denver Metro Region for nearly 40 years under the same ownership, CRS provides its clientele with the ultimate in quality resort style living in their own property. With a full-time architectural designer with over 30 years, CRS ensures its clients get the most out of their decorative concrete investment. To answer this question, it is best to understand what causes this deterioration phenomenon. Spalling, as it is known in the industry, is a surface failure of the concrete caused during the installation of the concrete. There are specifically two causes for this surface deterioration. Either, the concrete froze during the curing process, causing the concrete finish to be compromised (weakened) or it was very hot or there was too much concrete to finish and the concrete was over-worked and wet down to get the concrete finished thus compromising the finish. 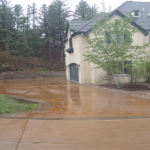 While there are only two causes of concrete spalling, there are a host of aggravating conditions that make this problem so wide spread affecting 1 out of 3 driveways in Colorado. Because concrete finishing is such a competitive industry and not that profitable, most contractors will install 3 to 4 driveways in a single day. During the summer months, you may have been the driveway done in the heat of the day with hot concrete and worn out finishers. Most commonly mistakes are the failure to use concrete pumps to place the concrete quickly. In the winter, it is a failure to cover the concrete with blankets to prevent overnight freezing especially on larger driveways due to the cost of these blankets and all results in concrete spalling. However, spalling is a surface phenomenon and rarely affects the structural integrity of the concrete itself, only the finished surface. However, if not attended to promptly, the concrete with continue to deteriorate beyond the initial surface until replacement is the only option. Until recent years, there was little alternative to tear out and replacement. Concrete Restoration Systems, by Malibu Pools is leading the advancement of alternatives. 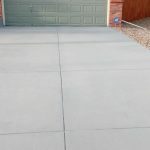 The obvious preference of homeowners is to have perhaps decorative concrete to installing plain gray concrete again and possibly having the same problem again. A few years ago, a client presented us with a concern that he had a radiant heated driveway and was told it would be more expensive to replace the radiant heating components in the driveway than the driveway itself, that was spalling. We began researching an alternative to replacement. We contacted over 90 vendors, suppliers of abrasives, grinding equipment manufacturers and concrete contractors and was told that tear out was the only solution. We then discovered a company out of Canada that was using horizontal concrete cutting machines to remove the initial surface that was spalling, staining the concrete and sealing. We bought one of these 75 machines in the world, purchased the most aggressive diamond cutters and set out to see if we could remove the bad concrete and make something look good. Wow, were we shocked! The machine and the cutters selected made the most beautiful driveway. With several passes, we removed the entire spalling surface, the stone in the concrete were exposed and the stain modeled throughout the finish. Impressive! This article was produced, to provide you with information about what is possible as an alternative to concrete replacement. This article was written by Daniel Yalacki, contractor/architect here in Denver with over 40 years of experience in the concrete industry, manufacturing, research and development of industrial products and services since 1978. Naturally, the perfect home features beautiful floors. 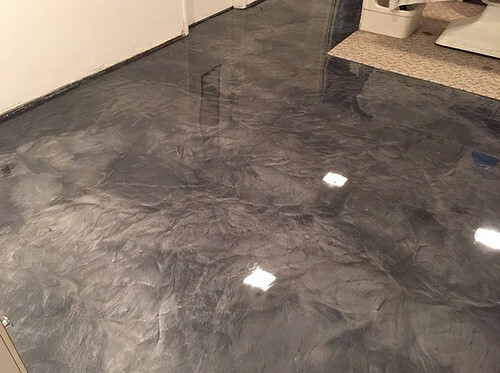 At Malibu Pools, we are certain we can create a decorative concrete floor for any room in your home that will be both beautiful and long-lasting. 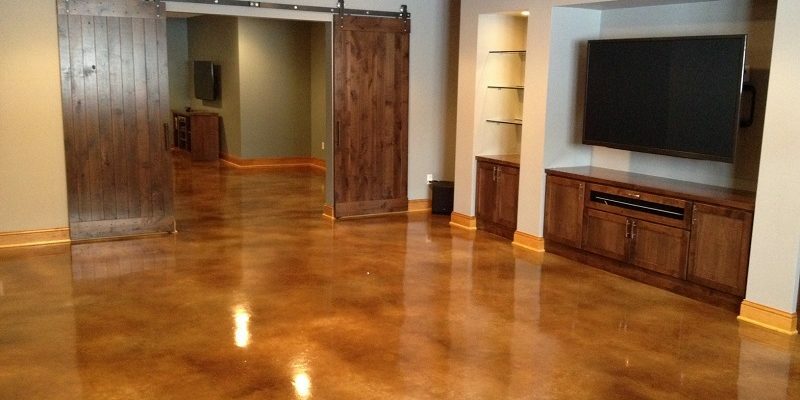 The first thing people want to know about considering a concrete floor is whether or not they are a good idea. 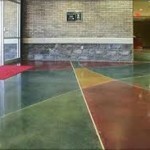 There are numerous benefits to choosing concrete for your floors. First, it requires minimal upkeep. Concrete is easy to keep clean and usually does not show damage for several years. You only need to mop it once a week. Second, it is cheap. 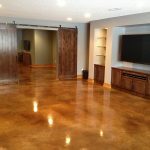 The cost of concrete floors is very low, about $2 to $6 per square foot to polish a plain gray slab, giving it a lustrous sheen. Finally, it lasts a long time. 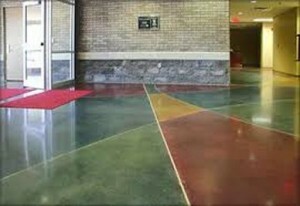 A polished and maintained concrete floor can last years and years with little day-to-day care. Concrete is an extremely versatile material. You can choose a range of colors and stains to make it uniquely your own. Dyes and paints can also lead to more vibrant and exciting shades. So, whether it is your kitchen floor, your living room, or somewhere else in your home, consider a concrete floor by Malibu Pools today as you make your home yours. Call us today for a quote. We’re excited to work with you! Colorado is known for its unpredictable weather, but it’s guaranteed that there always will be at least a few snow storms during the winter. When the temperatures drop, the days get shorter, and the clouds roll in, it is of the utmost importance to prepare your driveway for the changing seasons. Malibu Pools is an industry leader in customized decorative concrete landscaping and we want your driveways and other home features to last as long as possible. There are a couple of steps you can take to help prepare your driveway for the winter. First, it is important to remove growth and other debris from the existing cracks in your driveway in order to prevent them from growing in size or depth. Make sure to rinse following cleanup to wash away what’s left behind. If you don’t, snow will melt and get into the cracks and will then be held by the roots of the weeds. Then, as water freezes nightly in the cracks around the hard debris, the slabs will continue to separate, making the damage worse and worse. A power washer, nozzle on your hose, or sturdy broom on a warm day can take care of all of this. Don’t try to use water on the day before the cold snap; otherwise it will settle into the dirt and may expand the cracks. Don’t you hate it when you shovel and your blade slams into a crack that stops you and sends the snow flying? 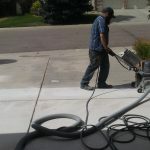 We can quickly and cheaply grind the split down, preventing you from having to replace the driveway after the winter. We’ll grind it flat and then seal the crack with our special epoxy, preventing additional cracking, enabling you to make it through the winter. If you have a blacktop, make sure to seal it every other year to protect it from cold temperatures and snowpack. A simple fix is to use a store bought product, but it might not last. The best option is to have a professional make a temporary mend to limit future damage and costs associated with replacing the driveway. 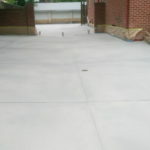 Our process allows concrete to dry in cold and moist times more quickly too. So even if it is the middle of winter, it is not too late to restore, grind down, or even replace your driveway quickly and efficiently. It is also important to use a salt guard, driveway cleaner, and an oil and grease stain remover to further protect your driveway from damage caused by salt deposits and keep it clean through the colder months. With winter quickly approaching, the question on many homeowners’ minds is how they can protect their property, specifically their landscape, from winter cracking due to extreme temperature changes. 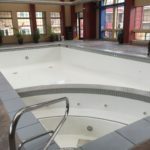 Having served residents in and around Denver for almost 40 years now, Malibu Pools is here to help you minimize winter cracking with these tips. First, make sure your surface is clean. That means no trash, leaves, or other debris in or around the cracks that already exist. Break out your broom and start sweeping things into bags. 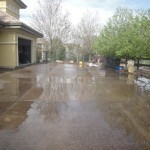 Use a driveway cleaning solution to remove stains and grease. If you have access to one, use a power washer to remove what you might not be able to get to yourself with just your hands. Second, it is important to always remember to use a good sealant as the temperatures start to drop. 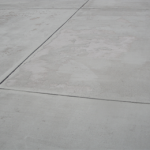 Sealant will close small cracks, help prevent new cracks from forming, and waterproofs your entire concrete surface. It is easy to use and takes just a few minutes to apply and dry. Lastly, consider contacting Malibu Pools to help you professionally protect your driveway from seasonal temperature changes. We are glad to help. Call us today for more information. Don’t let the cold get the best of you! Prepare for the winter and protect your driveway today! 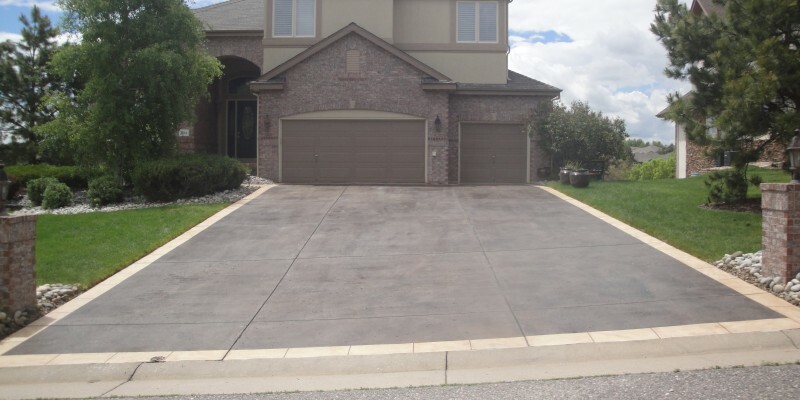 Picture your perfect concrete driveway. It’s sleek and smooth, not a crack in site. You look at it with pride and your friends are envious. Flash forward 10 years: it’s cracking and you no longer get that sense of pride when you see it. There might even be a few weeds sprouting. How disappointing! You are at a loss about how to fix it. What are you supposed to do? How can you restore it to its former glory? Over time, concrete deteriorates and starts to show signs of aging. Nobody wants a cracked or spalled driveway, but nobody wants to spend a fortune trying to restore it either—and concrete repair can add up if you don’t take care of it in time! 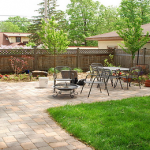 From the development of our exclusive Concrete Restoration System, to our Duracrete 2000 application that provides real solutions for spalling and deteriorated and discolored concrete, we are a leader in outdoor concrete home landscaping and restoration. Typical concrete costs $10/square foot to replace. Most companies will tear it out, reframe it, and out it, costing you thousands of dollars and sometimes weeks of inconvenience not being able to use your driveway. This isn’t the only way to approach restoring. Instead, you can use the existing foundation you have. 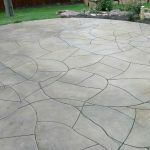 Many aren’t aware, but your concrete can be salvaged and can still look beautiful for far less time, money, and headache than completely replacing it. By developing the most advanced decorative and stained concrete finishes in the industry, Malibu Pools and Decorative Concrete has always been on the cutting edge of technology. 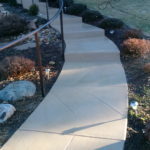 We truly are a leader in the decorative concrete landscaping and repair industry in the Denver Metro Area, serving residents all along the Front Range. We salvage driveways by grinding them down to their base, filling in any voids and cracks, and then stain them and add a protective layer to make them beautiful and long lasting. 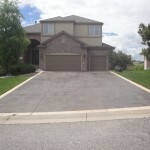 In the end, you will save time and money, and have an even more beautiful driveway than before. Let us here at Malibu Pools help you save money by restoring your concrete driveway today—call us for a quote.